TIP Engineering :: View topic - Shock Dyno area. Posted: Fri Dec 09, 2005 10:41 am Post subject: Shock Dyno area. I need a place to post these and my website is full of morons. Well my spare D2 dampers just got here today, so now I have to throw them on the dyno and see what I can actually get out of them. I"ll throw that up here once I get it done. Hopefully I'll be able to talk some people into letting me dyno some other aftermarket offerings so we have a accurate representation of what's out there. 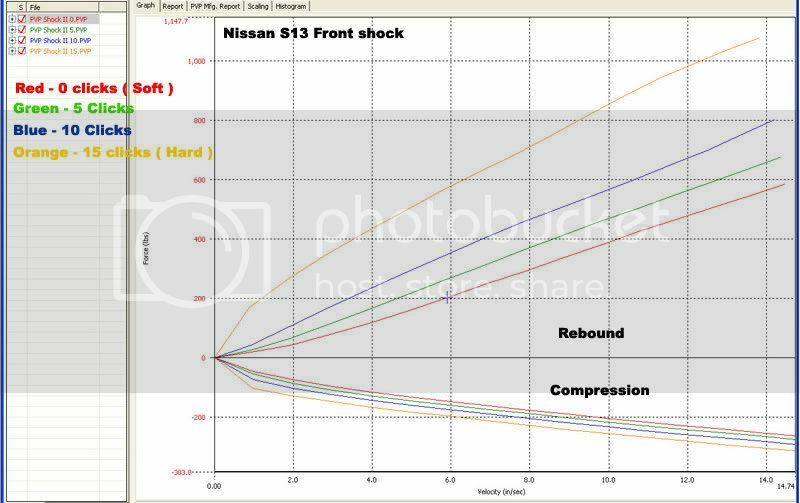 We need better graphs that the PVP ones that all the manufacturers show, we need something that will show the hysteresis and cavitation and the actual curve rather than a vague representation. Although the vague representation is still better than nothing. This is exactly what I was hoping for earlier... Id love to see an outside person throw a bunch of shocks on the dyno so normal people can get a good look of what works, and what doesnt. If I were near philly Id pull my GR+ off the car so you could get a look at the stance. This is the only graph I have, and it looks like its been smoothed out quite a bit.